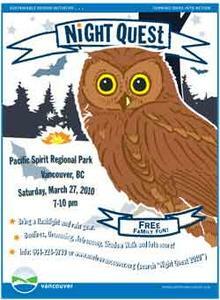 On Saturday, March 27, The Mondo Spider made a surprise appearance at Night Quest, an educational event in Pacific Spirit Regional Park that invites children and families to “experience the magical transition of day into night.” Participants are invited to lace up their boots, bring a flashlight, and follow a two-kilometre, lantern-lit trail to discover who sleeps and stirs on such a night. What better to discover along that trail than a giant, mechanical spider? The Mondo Spider, which now operates silently due to its zero emissions upgrade, inspired shrieks of delight from walkers who encountered her in the shadowy forest.